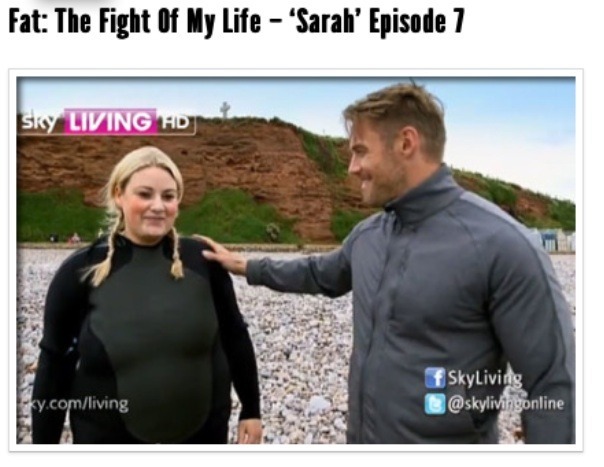 A brand new documentary series, Fat: The Fight Of My Life, will see ten inspirational individuals taking a journey full of highs and lows in their own battle to lose weight. With the help Jessie Pavelka and local personal trainers they will be there as mentor and weight loss expert, alongside a team of specialist clinicians, to monitor their progress throughout the year. But this is no quick fix solution. Filmed over the course of a year, the show will reveal an intimate and compelling portrait of their lives, as they struggle to follow a strictly orchestrated weight loss program of diet and exercise. Valentine Rawat worked hands on with Sarah Le Brocq in 2012. The training regime was tough and gruelling. 5am starts and 2 hours a day 5 days a week. A complete overhaul of her eating patterns all this was addressed step by step in order to achieve the results. The training still continues.